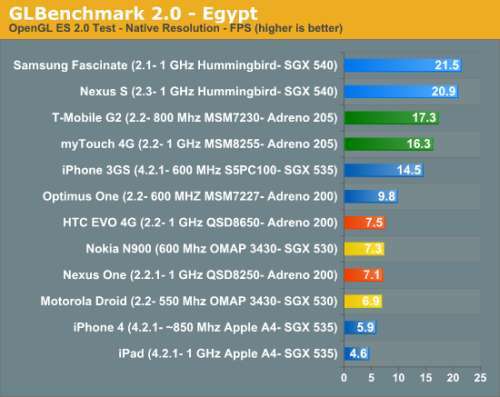 GLBenchmark is an OpenGL ES 2.0 performance test for mobile devices. It supports iOS, Android, Symbian, Windows Mobile, and Maemo. GLBenchmark 2.0 has been designed from the ground up to demonstrate and measure the true potential of OpenGL ES 2.0 Hardware. The built-in shader code (GLSL) generator enables real-time performance tuning and de-compositing. This is an in-valuable feature for OpenGL ES 2.0 Hardware vendors and Handset manufacturers. The hummingbird rules. I absolutely love my Galaxy S! The render quality of the graphincs is mostly at the level of GeForce 256. I should admit that I am a bit surprised by the iPhone4 score, especially compared to the 3GS !! Thus, it seems this benchmark doesn’t take the output resolution into account !! Can’t you get the benchmark from here ? sadly my Omnia I8910 HD was not supported.